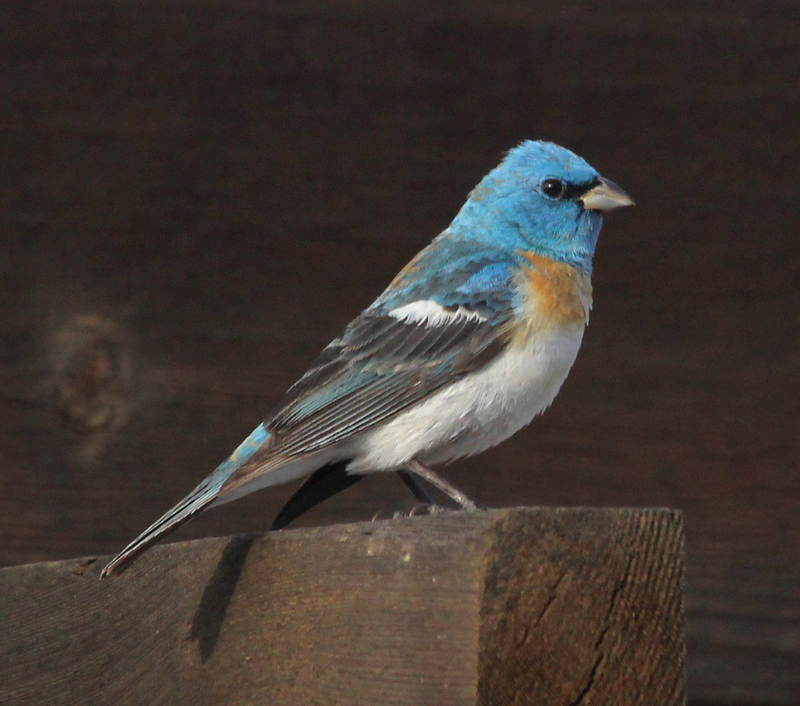 Fort Collins, CO – DECEMBER 23, 2015 - A Lazuli Bunting, a beautiful songbird commonly residing in the southwest and Mexico in winter, was sighted and photographed at the Gardens on Spring Creek, 2145 Centre Avenue, on December 19, 2015. The bird is the first of its kind to ever be seen in winter in Colorado. The male bird was discovered by Rachel Hopper, a Northern Colorado resident and photographer. This bird sighting and documentation designates the Gardens on Spring Creek, Fort Collins' community botanic garden, as a birding hotspot by the Ebird database developed by the Cornell Lab of Ornithology and Audubon. “We are excited that the diversity and maturity of our plant collection is creating expanded habitat for birds in northern Colorado,” said Michelle Provaznik, Director of the Gardens on Spring Creek. According to David Leatherman, former forest entomologist for Colorado State Forest Service, "Lazuli Buntings are what ecologists call a "neotropical migrant", spending their summers in northern areas and breed, winter in the neotropics, and migrate between the two areas spring and autumn. In Colorado, they are common in most of the state at elevations of 5,000-9,000 feet. In Larimer County, the foothills are their stronghold. They winter mostly along the west coast of Mexico, with a very few regularly spending the winter months in southeastern AZ." "Very rarely a Lazuli Bunting spends the winter in a northern place. The bird at the Gardens on Spring Creek is a bright blue, orange, and white male. The nesting might have been late due to all the spring and early summer rains. It obviously was not paying attention and did not notice all the members of its kind disappearing on schedule in August and September." At the Gardens, the bird was discovered hiding with House Sparrows in the "Secret Garden" junipers in the Children's Garden. It has been seen at the feeders in the Sustainable Backyard, along the north side of the main office, and in various trees (spruce and juniper) in the northern part of the property. When on the north side of the building, it seemed to be enjoying the heated walls and insects in the window sills. "Feeders stocked with small seeds, ornamental grasses, shrubs with berries, and open water will be key to enticing this bird to stay," Leatherman said. "Its appearance, the first for a Lazuli Bunting anywhere in Colorado during a Christmas Bird Count, is a testament to the maturing nature and habitat at the Gardens on Spring Creek. We can learn a lot by watching which plants birds use in what season and transferring that knowledge to our own properties." Recently designated as a Habitat Hero Garden by Audubon Rockies, the Gardens on Spring Creek is open Monday through Friday, 9 a.m. - 5 p.m. and Saturday, 9 a.m. - 4 p.m.